The art of Eurythmy is taught in the Waldorf schools throughout the world as a core specialty subject, serving as an integral part of the Waldorf curriculum from pre-kindergarten through high school. It is one of the ways in which Waldorf education can be said to be a multi-modal learning experience. Eurythmy addresses the core value of strengthening the will and addressing a sense for beauty and esthetics in countless and manifold ways. Above all, eurythmy is an art form. Eurythmy takes its place alongside painting and music as an artistic experience for the child. What is unique about eurythmy, however, is that the medium for the art is the body itself, and our gestures. It is thus one of the most powerful tools of Waldorf approach, and Rudolf Steiner counseled that no school should be without it. In eurythmy, we experience that with our gestures we can be artists and express the inner dynamic of poetry, with its wonderful cadences and its play with sound. With our gestures we can also express the inner life of music: its beat, rhythm, and pitch, its phrasing and dynamic, the musical tones and intervals. We work with dramatic, lyric and epic content, as well as with color and form. From the very first days of the Waldorf school movement, Rudolf Steiner asked and expected that eurythmy be an integral part of the curriculum. Eurythmy is intended to be offered to the children one period a week through grade 3, and twice a week from then on through 12th grade There is a specific learning journey in eurythmy that accompanies the developmental stages of the growing child, paralleling with elegance the curriculum carried by the class teacher. By the time the children are in high school, they can perform eurythmy to complex music compositions and exquisite poetry. Along the way, however, there are many profound and complex learning experiences that the children must pass through. Eurythmists have learned through their training how to develop fun, engaging exercises that help the children develop these skills, individually modified and developed according to the needs of the class. What does it take to be a eurythmist? 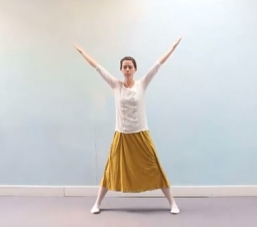 A eurythmy training is a 4-year, full-time training. What movement exercises can a class teacher do? A class teacher doesn’t have the width and breadth of insight into the etheric experiences of eurythmy to bring formal eurythmy exercises to the children. However, if you don’t have a eurythmist in your school, you can learn from a eurythmist some important elements that you can modify for you class. For instance, you can learn to do exercises to help with body geography, spatial orientation, mirroring exercises, moving the forms of form drawing, concentration exercises and the like. However, the exercises built on doing eurythmy gestures for sounds and for music are not advised. Instead, you can work instead on learning to do wonderful, eloquent, ensouled movements as they teach poems and story. Can a school do without a eurythmy program? Surely it is possible, but if a school is fortunate enough to have an inspired and competent eurythmist who can relate to children, faculty and staff, everyone will agree that they would never wish to be without a full eurythmy program! Because of the importance of Eurythmy in Waldorf inspired programs all Earthschooling curriculum offers Eurythmy lessons (as well as many other essential teacher support tutorials) as part of their curriculum packages HERE. For more insights into the background and philosophy of eurythmy, and video recordings that show how to develop your own personal eurythmy practice, you can visit my website and www.eurythmyonline.com, or contact me at info@eurythmyonline.com. This article is part two of the series “Why is Eurythmy Important”. To read part one link HERE. To read part three link HERE.